For Samantha Sperber, home is truly where the heart is. Sperber, 19, already has a year of pre-medicine under her belt at Edmonton’s Grant MacEwan University, but the farm girl from Ponoka, Alta., also has home-grown career options that are just as appealing. “I would love to stay in the cattle industry. My grandpa (Mike Hatala) and my father (Ron Sperber) have farmed together, and our farm has been in the family for almost 100 years,” says Sperber, who’s debating a career in embryology or optometry at university. “I’d love to keep that tradition. “There’s a lot of pride in that, knowing your family has so much dedication,” adds Sperber, whose family runs a mixed operation, with a 200-head cow/calf operation and about 1,900 acres seeded to grain. “And to see your animals do well is just as rewarding as seeing your high school football team win the championship or something. Regardless of Sperber’s eventual career path, the Calgary Stampede’s annual International Youth Livestock Show is helping her defray educational costs. Sperber was one of eight young leading lights of the agricultural industry presented with a $2,000 IYLS post-secondary scholarship on Saturday. In all, more than $35,000 in IYLS scholarships was distributed to 28 ofAlberta agriculture’s future custodians by sponsors ConocoPhillips, Enbridge, United Farmers of Alberta, Ted and Enid Jansen, WA Ranches, and the Calgary Stampede Foundation. The scholarship recipients were introduced and recognized on Saturday night during the evening Grandstand Show at Stampede Park. 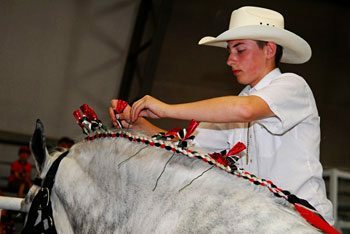 The International Youth Livestock Show has traditionally been an integral part of the Calgary Stampede, with competition taking place over the final four days of The Greatest Outdoor Show on Earth. In 2010, however, the annual competition headed off in a fresh and exciting new direction, becoming a collaborative effort between the Stampede and the Olds Agricultural Society called Summer Synergy 2010. A much larger, intense, and integrated competition, the four-day Summer Synergy 2010, which wrapped up Friday, July 16, drew a total of 341 competitors from across Western Canada. Much of this year’s Summer Synergy event, including a youth marketing competition, a multi-species judging competition, conformation, showmanship, and a senior herdsman quiz, was held in Olds from Sunday, July 11 to Friday, July 16. Youths exhibited animals in four species classes – sheep, dairy, heavy horse, or beef. Calgary Stampede International Youth scholarship interviews were held on Stampede Park on July 17. Seven other senior-aged participants, Tyson Hertz of Duchess (beef), Sarah Hunder of Spruce View (heavy horse), Rosie Templeton of Lethbridge (beef), Katelyn Dietrich of Forestburg (beef), Sawyer Daley of Carstairs (beef), Jessica Sperber of Ponoka (beef), and Ethan Gosling of Strathmore (beef), received $2,000 scholarships, while 10 scholarships in the amount of $1,000 were awarded to Chad Crest of Leduc (dairy), Carling Matejka of Ponoka (beef), Cameron Olson of Indus (beef), Luke Marshall of Innisfail (beef), Adam Nixdorff of Balzac (beef), Kelby Tannas of Cremona (heavy horse), Katelyn Crest of Leduc (dairy), Margreit Appel of Penhold (dairy), Emily Puch of Pincher Creek (beef), and Brittany Matejka of Ponoka (beef). Three intermediate-aged contestants, Tyler Dietrich of Forestburg (beef), Andie Hadway of Didsbury (beef), and Dakota Townsend of Sylvan Lake (beef), won $1,000 scholarships. Seven others won $500 scholarships – Kathryn Dolliver of Stettler (beef), Samuel Haeni of Didsbury (dairy), Tyson Matejka of Ponoka (beef), Jonas Haeni of Didsbury (dairy), Delia Loomis of Caroline (heavy horse), Coleman Nixdorff of Balzac (beef), and J.T. Ross of Crossfield (beef). Junior contestants, aged 9 to 11, competed for prizes, ribbons and fun. A new component of the Summer Synergy partnership was the introduction of the International Youth Livestock Supreme Championship, integrated into the Stampede’s UFA Steer Classic on Saturday, July 17. Four young competitors who displayed exceptional conformation and presentation of their respective species projects were crowned under the Stampede’s Big Top in various classes — Supreme Purebred Beef Champion (Brandon Hertz of Duchess), Supreme Commercial Beef Champion (Tyson Hertz of Duchess), Supreme Dairy Champion (Crest), and Supreme Heavy Horse Champion (Nicole Ruzicka of Viking). The four were selected from two dozen champions who earned a winner’s ribbon leading up to the Stampede — either at 4-H on Parade, from May 28 to 30 at the Stampede; the Provincial 4-H Beef Heifer Show, in Olds, from July 11 to 13; the International Youth Heavy Horse Show, in Calgary, on July 12; the Provincial 4-H Dairy Show, in Olds, from July 13 to 16; or the Summer Synergy show.